The “show your colour” project consists of a 6×9 meters digital billboard which will be displayed on top of the Marmara Hotel, in downtown Istanbul. The installation will consist of an animation in which the nationalist motto ‘How happy I am to say that I’m a Turk’ will appear in different languages on a red background. The different languages used in the installation are either currently spoken in Turkey or used to be spoken in the country until some time in the 20th century. Whether in use or not, none of them are officially recognized by the Turkish state. The state only admits the Turkish language as the official language of Turkey, oppressing minorities of different ethnic backgrounds. The „show your colour” aims to show the holes and symptoms of the nationalist symbolic order. It focuses on the statement ‘How happy I am to say that I’m a Turk’ (“Ne mutlu Türküm diyene”), which is attributed to Mustafa Kemal Ataturk, the founder of the Turkish Republic, and is very familiar to residents of Turkey. Transformed into a motto, or even a slogan, this statement embodies the nationalist identity politics of the Turkish Republic: it says how inhabitants of Turkey need to define themselves as Turks. 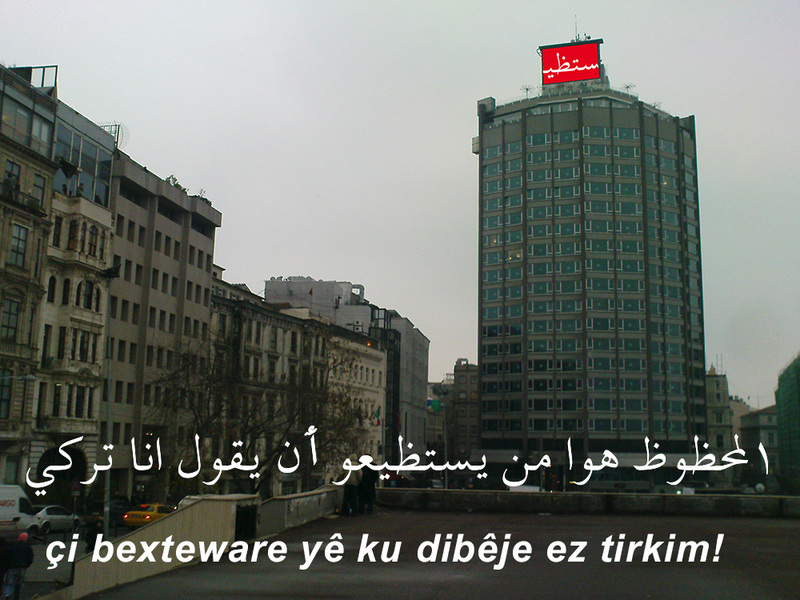 The “show your colour” project will display a Kurdish translation of this sentence (“çi bexteware yê ku dibêje ez tirkim!”), on a red background. With the red background reminding of the Turkish national flag, the display renders a widely known, identity forging national slogan in a subverted form, thus producing a paradoxical statement. The animation will then show the message in other minority languages, such as Armenian, Laz, and Arabic, always projected onto a red background. The succession of different languages will prompt onlookers to recall that Istanbul was once a multilingual city. In the case of Arabic script, in addition, it will highlight the radical break with the past that was brought about by the adoption of the Latin alphabet during the early days of the Turkish Republic. The national symbol of the flag combined with the voice of the Other will make it difficult to understand whose voice is speaking: at first sight onlookers will think it is everyday State propaganda but as text in other languages appears projected on the same background, the clarity of the propaganda message will be obscured. Onlookers will be challenged to make sense of a message which plays with its inner contradictions. The work can be read and understood in different ways. We have, for example, the rendering of a nationalistic slogan in Kurdish symbols, which not only appear foreign, but are strongly associated with separatism and terrorism. Beyond the contradiction between the code (which is inclusive) and the content (the actual meaning, which is highly exclusive); that the background is red, reminding of the Turkish flag, adds another dimension to the work. Foreign symbols appear on what at first glance appears to be a Turkish flag. Thus the usual ethnic-nationalistic symbolic order is breached. Those who can read the relevant languages are faced with the inherent contradiction of having the phrase “happy is he who can call himself a Turk” written in their own language. The minorities are for the first time directly addressed by a national slogan which, though meant to be inclusive and produce identification, has the exact opposite effect on them: it excludes them. On the other hand, the ethnic Turkish majority is excluded by a code it can not decipher, which it sees associated with its own symbols. In this way the project challenges the ethnic-nationalistic boundaries and identities, addressing the questions of identity, inclusion and exclusion in an immediate and highly relevant manner. It was impossible to carry out the project “show your colours”. Those responsible for the YAMA project express their concerns at the realisation of the project: „It would be impossible to show this work since it is not just any gallery, it stands on the hotel. So if something happens, the hotel will be targeted as such”. We refuse to carry out the project anywhere else, seeing as the project can only have the intended effect if exhibited where initially planned. We accept that YAMA is “not just any gallery”; it is the reason we wanted to exhibit there. It is saddening to see the art world censor itself, depriving itself of one of its main reasons to be. Public space as censored space, public space as castrated space. The project shows up cracks in the current Turkish identity politics. Since YAMA means “to mend”, it is more than a coincidence that the project wants to be presented on YAMA.